These pictures were taken on a visit to New York. 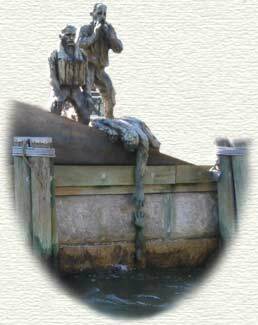 The first group shows the American Merchant Marine Memorial in Battery Park (sculpture by Marisol), inspired by a photograph of survivors of a U-boat attack (they later perished - see text below), and dedicated Oct. 8-1991. It is by far the most powerful memorial I've ever seen! The water splashed up against the side, and every time it receded the head and shoulders of the man in the water came into view. After I had posted these pictures I left a message on my Ship Forum. In a response to this message, Captain George Duffy says that for about four weeks in October and November 1942, he was a prisoner aboard the German navy's supply ship Uckermark (ex-Altmark). Her commander, who had been a prisoner of the British in New Zealand during World War I, understood their predicament, and asked his crew to give them whatever chess sets, checkers, playing cards, books, magazines, etc. they could spare. One day, Captain Duffy was perusing the "Berliner Illustrierte Zeitung", issue number 27 -1942, a weekly publication similar to "Parade" which, he says, almost everyone in the United States reads. He came across a full page of photos and captions depicting a burning U.S. oil tanker which had been torpedoed by a German U-boat commanded by Kapitanleutnant Hardegen who was also pictured. The page contained two photos of a life raft carrying seven men, obviously American merchant seamen. Believing these men would appreciate seeing themselves in such a situation, and naively thinking the war would not last very long, Captain Duffy tore the page out of the magazine, folded it, and secreted it away with his meagre belongings. Amazingly, that piece of paper survived 1,119 days of captivity. (Read about Captain Duffy's war experiences at The Dreadful Saga of the MV American Leader and her Crew - this is an external link). After the war, he took this page to as many of the oil tanker companies as he could find in New York. No one could identify the seven men. From time to time he published it in books he had written. Again there was no response. Eventually, in the early '80s, forty years after he had saved the page, a break occurred when Captain Arthur Moore contacted him and told him he was writing a history of the United States Merchant Marine in WW II (this book is entitled "A Careless Word, A Needless Sinking" - my Books page has information on how it can be obtained). Captain Duffy sent the page to him, and he, in turn, took it to the F.B.I. which enhanced the photo of the men and was able to read the ship's name stencilled on one of the life jackets, S.S. Muskogee. Captain Moore's records disclosed the Muskogee had been lost with all hands. Captain Duffy says in his message: "ALL HANDS! And for all those years I had been searching for living survivors!" He continues, "A photo-journalist on board Hardegen's U-123 on its second war patrol to the east coast of the United States had taken the pictures, and the submarine left the scene. No one ever saw the seven men again. The well known writer and historian Charles Dana Gibson has written of the photo of the seven men, '(it) is the starkest portrayal ever caught on film depicting the toll the sea can extract from a ship's company. It is a circumstance that spans the ages'". At the unveiling of the Memorial on October 8, 1991, Captain Duffy was privileged to be the first individual to take his place on the base of the monument, standing next to the figure of the man with his hands cupped to his mouth. There used to be a webpage entitled "A Tribute to Anthony G. Sousa", which I found when running a search for Muskogee, but it looks like it has now been taken down. It had a picture of the 7 men on the raft (one of whom was Sousa, the fellow with his hands to his mouth), and I later learnt that this was, in fact, the very picture Captain Duffy kept with him all those years (the marks from the folds in the paper were clearly visible). The picture is also included in Captain Moore's book, with the names of 4 of the men on the raft. Captain Duffy has told me that the information on Muskogee in the first edition of the book contained an error with regard to the position of the sinking. He says it happened about 450 miles north-northeast of Bermuda, and she did not burn as some claim; that was just German propaganda. Later editions of the book carried corrections. (Uboat.net has some information on the sinking, with a map showing the approximate location - also external link). The text reads: "Dedicated in the year 1982 to the people of the United States of America by war veterans of the Norwegian Merchant Marine and The Royal Norwegian Navy in memory of help and hospitality shown during our mutual struggle for freedom and peace in WW II". This is the other side, and the text reads: "These boulders were brought here from the coast of Norway (I believe they're from Stord) where forces of nature have worn and shaped them for thousands of years". 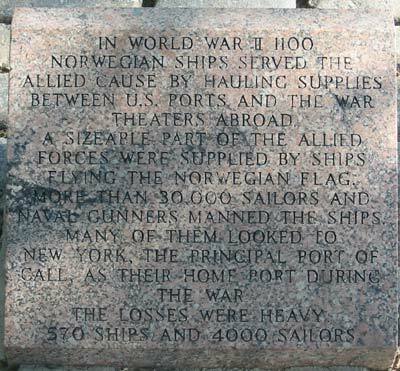 Another Norwegian memorial, also at Battery Park, New York. These pictures were received from Richard Kite (some of these vessels are discussed on this website). Merchant Marine Memorial - For HMS Jervis Bay, HMS Laurentic and others. Jacob's Ladder - At the American Merchant Marine Veteran's Memorial, San Pedro, California. Here's another view of it. Camden N. J. WW II M.M. 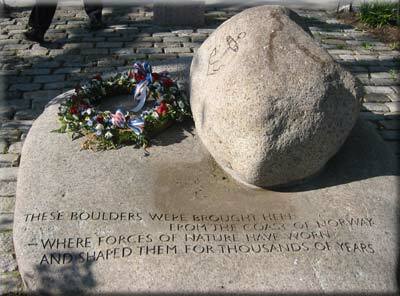 Memorial - The names and stories of 10 seamen from the area. Maritime Museums and Memorials - List of museums and memorials in the various parts of the U. S.
Australian War Memorial - Roll of Honour Database. 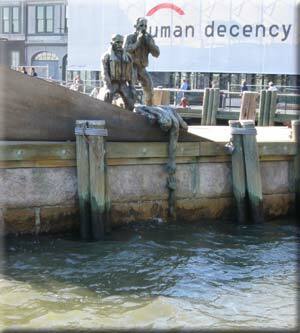 Australian Merchant Seamen's Memorial - Very powerful sculpture at Campbell. 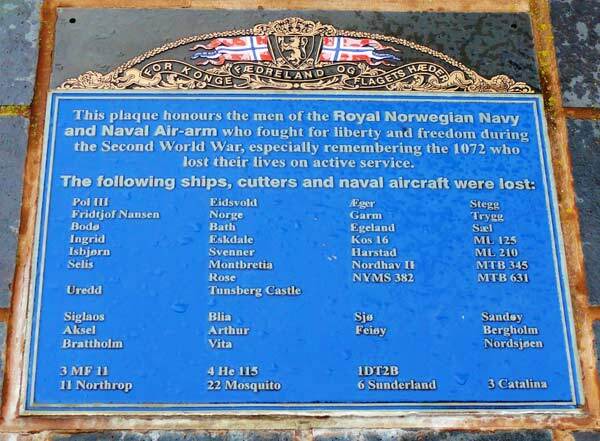 The names on the plaques are also given, along with the names of ships, several Norwegian (a section of War Memorials in Australia). Dept of Honour Register - Commonwealth War Graves Commission. Merchant Navy Memorial - Liverpool. Bedfordshire War Memorials - A long list of memorials (WW I & WW II), includes names of those commemorated. Merchant Navy Memorial - Halifax, Nova Scotia. Allied Merchant Navy Memorial - St. John's, N. F.
The Buckden Pike Memorial Stone - Moving story about an RAF plane crash and its sole survivor. Stavne Cemetery, Trondheim - According to this site there are a total of 155 Commonwealth War Graves of allied servicemen from WW2 at this cemetery. 27 Navy, 24 Army, 99 Air Force, 5 Merchant Navy, of which 140 are British, 6 Canadian, 5 Australian, 3 New Zealand and 1 South African. (See also my Survivors/Fatalties Page 5). 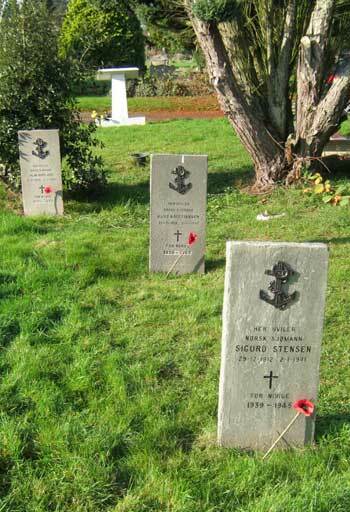 Mariners Buried/Commemorated in European Theater National Cemeteries - This is a section of the American Merchant Marine website, and lists seamen of misc. nationalities. There's also a page for Mariners Buried or Commemorated in Pacific Theater National Cemeteries with a link at the bottom of the page to a list of these cemeteries. In a Norwegian magazine ("Krigsseileren" No. 1 for 1996) I came across a short article entitled "Durban's Lady in White", telling the story of Perla Gibson who is remembered by many a seaman for singing to the troopships as they went by, often standing on North Pier with a megaphone in her hand. The article ends by saying a memorial has been raised for her on North Pier with the inscription: "To the Memory of Perla Gibson THE LADY IN WHITE who sang to countless thousands of British commonwealth and allied serivcemen as they passed through Durban over the years 1940 to 1971. This tablet was presented by the officers and men of The Royal Navy". There's also a book written about her and this can also be found on the Internet. Some years ago I came across an article in the Norwegian magazine "Krigsseileren" No. 1 for 1985, which says that during the war, the American Tuberculosis sanatorium in Adirondack, NY treated a few Norwegians who were sick or injured. 16 of them died and were buried at Pine Ridge Cemetery, Saranac Lake, NY, which (according to the article) is located about 6 hours' drive northwest of New York City. From early on the graves were tended by 2 Norwegian seamen who settled in Saranac Lake after the war, Alfred Larsen and Jacob Jacobsen, until the place was restored at some point (in the early 1980's?) by Anders Knutsen, who lived in Vermont, NY. He brushed the name plates, had the area surrounded by a nice iron chain fence (with the help of sculptor Samuel Ogden, who also lived in Vermont) and otherwise fixed the place up. Funds have since been supplied to keep it seen to on a regular basis. 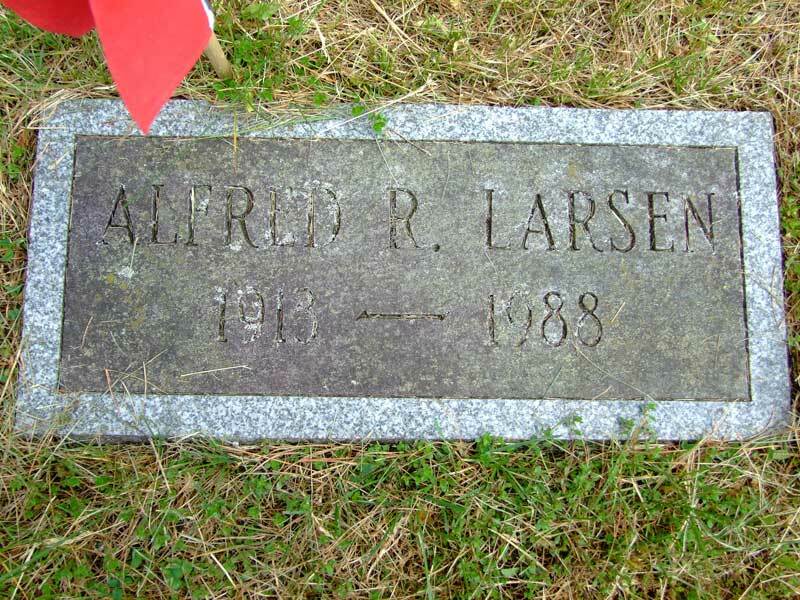 As can be seen from the photo of the last name plate in the table below, Alfred Larsen died in 1988 and is buried with the other seamen at Pine Ridge Cemetery. According to this external page, he had also been a patient, but recovered and resumed his service in the Merchant Marines. The site adds that after the war, he married a "tray girl" whom he had met while a patient at Sageman Cottage (external link). This external page has some information on Jacob Jacobsen. On Memorial Day, May 31-2010, I visited Pine Ridge with my family at which time these pictures were taken by my son. 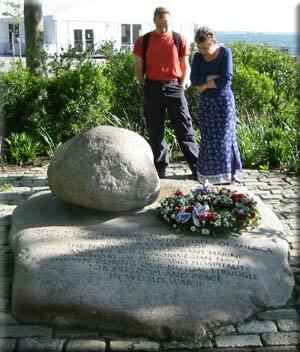 As can be seen, they all had Norwegian flags next to them, and before we left we placed a single rose next to the stones. With a single rose, my children, my grandson and I, in other words, 3 generations on, have remembered and honoured these seamen, who never got to see their home again. (This picture of all of us was taken by my son-in-law, Michael J. Huxley, all the rest were taken by my son, who holds his nephew on his shoulders). 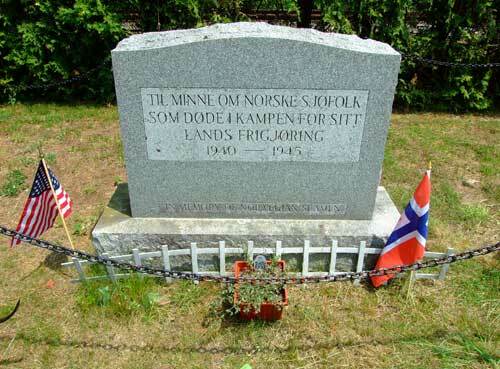 "Til minne om norske sjøfolk som døde i kampen for sitt lands frigjøring 1940-1945"
"In Memory of Norwegian Seamen who died in the fight for their country's freedom 1940-1945". The names were initially found in the above mentioned "Krigsseileren" article and the information has since been compared to and supplemented with details found in "Våre falne", a series of 4 books listing Norwegian casualties during WW II. (The pictures of the seamen also came from these books). Where I suspect the information is erroneous, I've made a note of this. If further errors are spotted, I would welcome corrections (my contact address has been provided at the bottom of this page). Please note that any reference to New York is not New York City, but the state of New York. Click on each stone to open a larger image in a new window. Alfred Thorvald Abrahamsen, born in Farsund on Apr. 9-1920, sailed as steward in allied service on several ships until he contracted tuberculosis at the end of 1943. Died Sept. 13-1945. (The "Krigsseileren" article gives the ship's name as Lake Traverse - not sure if there was a ship by that name, if so, it was not Norwegian). Olav Bernhard Berge, born in Haugesund on Febr. 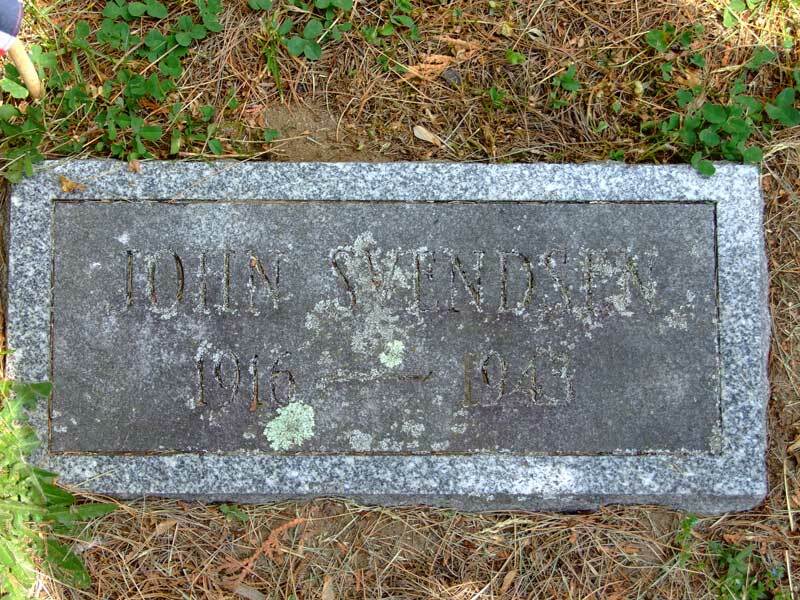 18-1920, had served in the Merchant Marines for about 10 years when he became ill (tuberculosis) and died at Saranac Lake on Febr. 2-1945. Ship(s) not named in "Våre falne", though it states that he had previously survived a sinking; perhaps he's identical to the seaman who's listed as Olaf B. Berge in the crew list for Tancred? 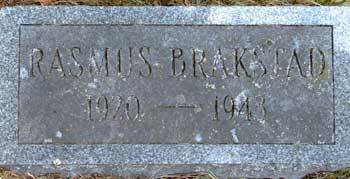 It further states that his brother Anders was killed in 1942. 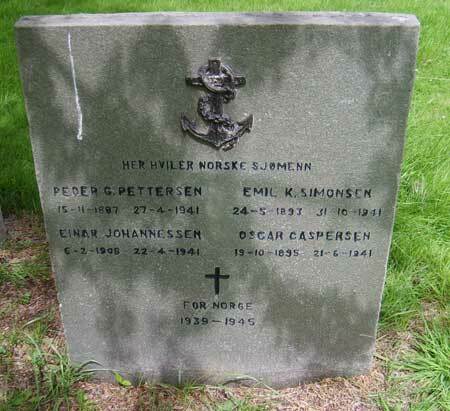 This may have been the Anders Berge who was killed when Sama was sunk(?). Rasmus Meidel Brakstad, able seaman, was born at Stord on June 8-1920. 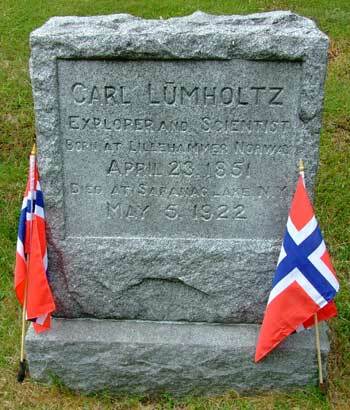 He had been in allied service on several ships, his last ship being the Norwegian Gansfjord, until he contracted tuberculosis and was taken ashore. Died on Jan. 9-1943. 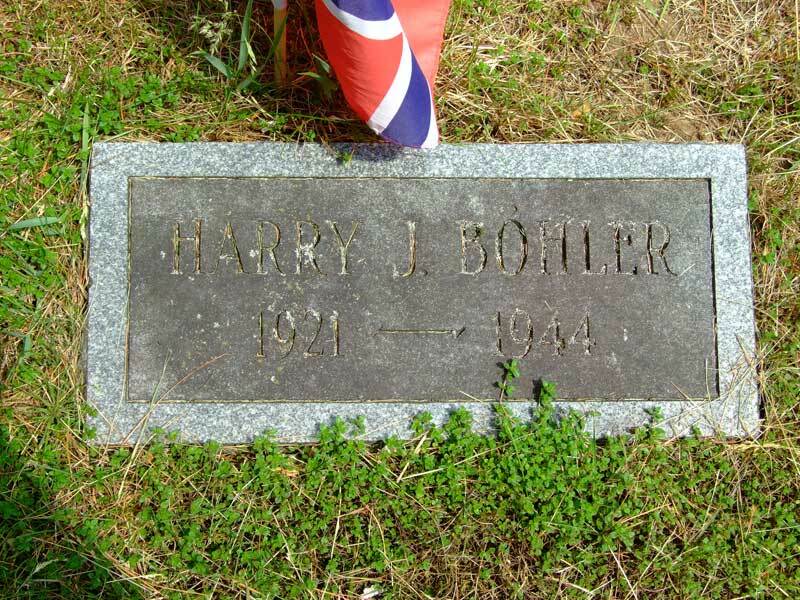 Harry John Reinholdt Bøhler, born in Slagen on Jan. 23-1921, went to sea in 1939 as oiler and sailed in allied service until he became ill and had to pay off. 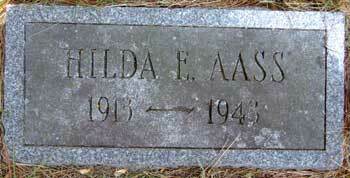 Died on Oct. 15-1944 at "a hospital in New York". The "Krigsseileren" article gives his ship as Boiaca, possibly a mis-spelling of Bianca? 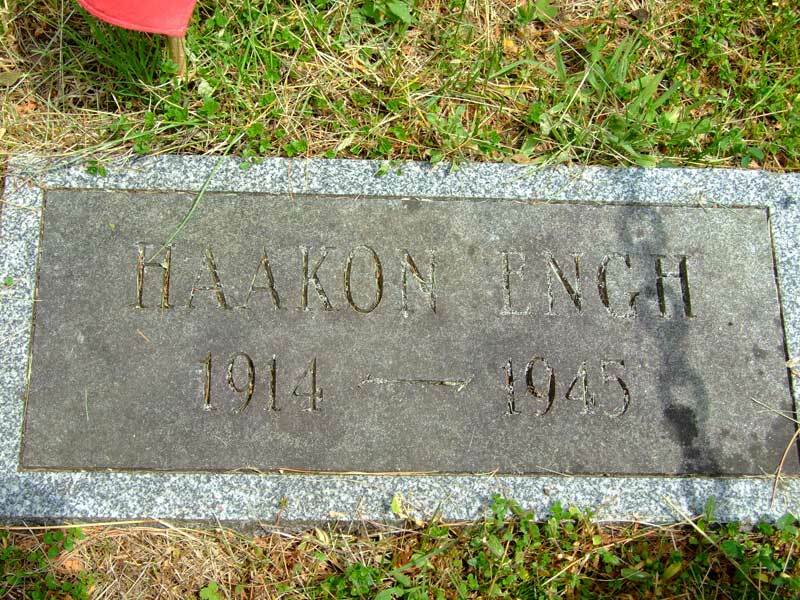 Haakon Andreas Engh, carpenter, born at Hurum on Oct. 31-1914 ("Krigsseileren" says he was born in 1897). According to "Våre falne", he was injured after 3 torpedoeings of Alar and admitted to Gabriel Sanatorium in Halifax (incorrect*) where he died on July 17-1945. Please note, however, that I have no information that Alar was ever torpedoed, but there's an able seaman by this name in the crew list for Høegh Giant, which was torpedoed in June-1942 (follow link for more info). 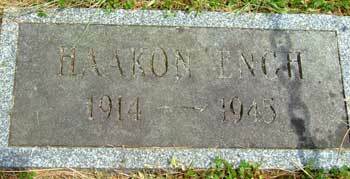 Additionally, there's a Haakon Engh in the crew list for Gro, but he was a cook. *According to a message in my Guestbook, Gabriels is a tiny town seven miles north of Saranac Lake. The sanitorium was founded and run by the Catholic "Sisters of Mercy" and was named for a Catholic leader, Bishop Gabriels. This external page has more info on the sanatorium. 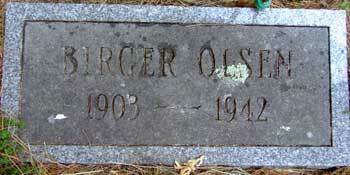 Otto Wilhelm Eriksen, electrician, was born in Arendal on Sept. 25-1906 ("Krigsseileren" states he was born in 1896). "Våre falne" says he was torpedoed and later contracted tuberculosis, adding that he died in 1942 at Stanley Vold Hospital, Canada and is buried in Canada*. The ship's name is given as Rio, while the "Krigsseileren" article gives the ship as Rio Branco. Again, as far as I know, this ship was never torpedoed, but it's possible he had served on her at some point. 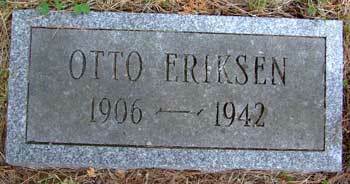 For info, there's an Otto Eriksen included in the crew list for Sarita, which was torpedoed in July-1940 - same person? *This information is probably incorrect. In fact, this Guestbook message suggests that he was most probably treated at Stony Wold Sanatorium, NY. See also this external page. 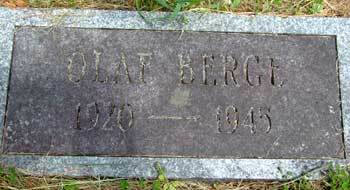 Karl Eugen Forsberg, steward, was born in Glemmen on Sept. 30-1911. He had been a whale catcher since the age of 15. Sailed in allied service until he became ill and died on May 25-1944. The "Krigsseileren" article gives his last ship as Santos, but he's not included in the crew list for this ship, so had probably left before she was lost. 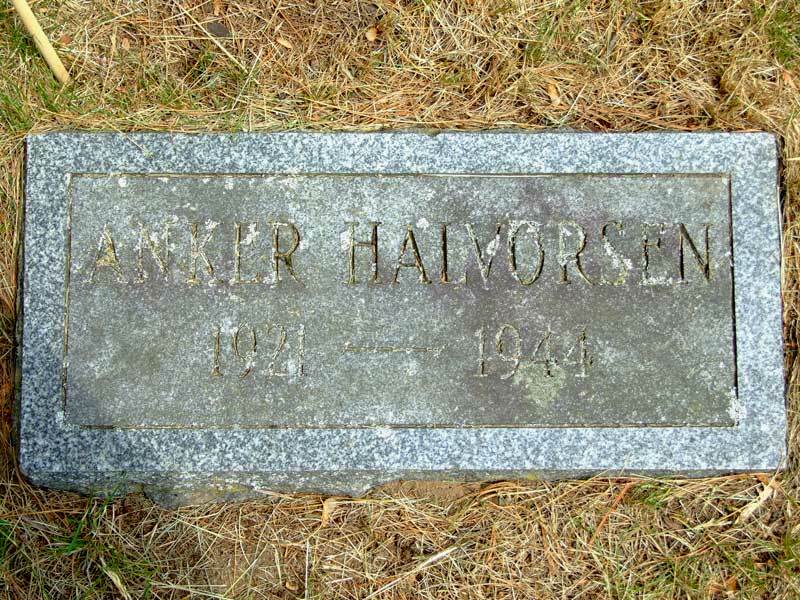 Anker Emil Halvorsen, able seaman and gunner from Bergen, Norway, was born on May 9-1921, went to sea in the summer of 1939, became ill and died at Spears Sanatorium, Saranac Lake on March 6-1944, after having been sick for a year and a half. (Ship not named). This external page has some information on Spears Cottage. 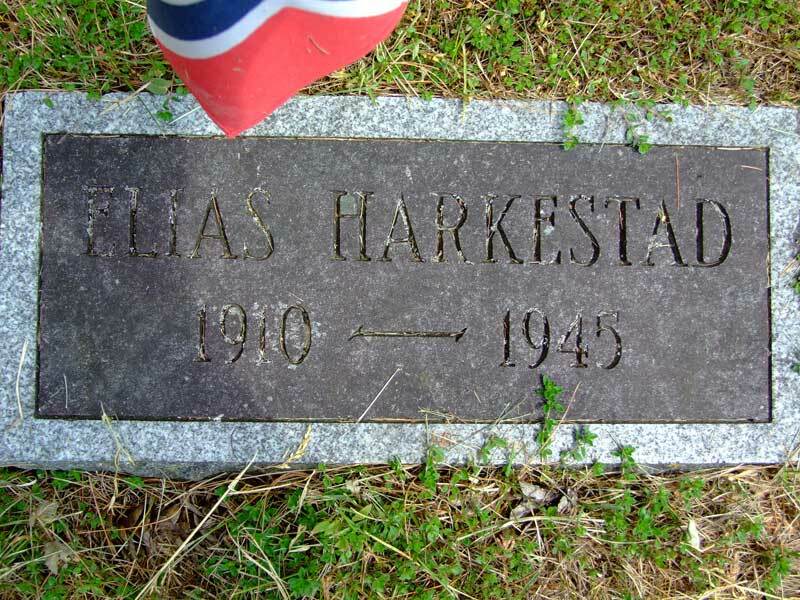 Elias Harkestad, born in Herdla on Dec. 10-1910, is said to have escaped to England on Sept. 29-1941. I found him and his brother as taking part in the escape with M/B Fred / Fri; date given as Sept. 26 - follow the link for more details. He served in the Merchant Marines both before and during the war. Became ill and died at "a hospital in the U.S." on March 18-1945 (ship not named). His brother Anton, who had also escaped to England and later joined the Marines, had died in England on Apr. 7-1944. On board Fred at the time was also a Paul Harkestad, whom I believe is identical to the Paul Harkestad who was killed when D/S Victo was sunk. 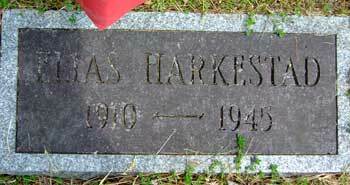 Additionally, there's a Nils A. E. K. Harkestad who took part in the same escape. "Våre falne" states he was killed when Sneland I was sunk on May 7-1945, listed as Nils A Konradsen in my crew list for that ship (his father's name was Konrad, hence the Konradsen). Vilhelm Harkestad, who also took part in the escape, may be identical to the able seaman by that name who survived the sinking of Ruth I in 1944 - follow the links to my pages about these ships. They were all from Herdla, and probably related. 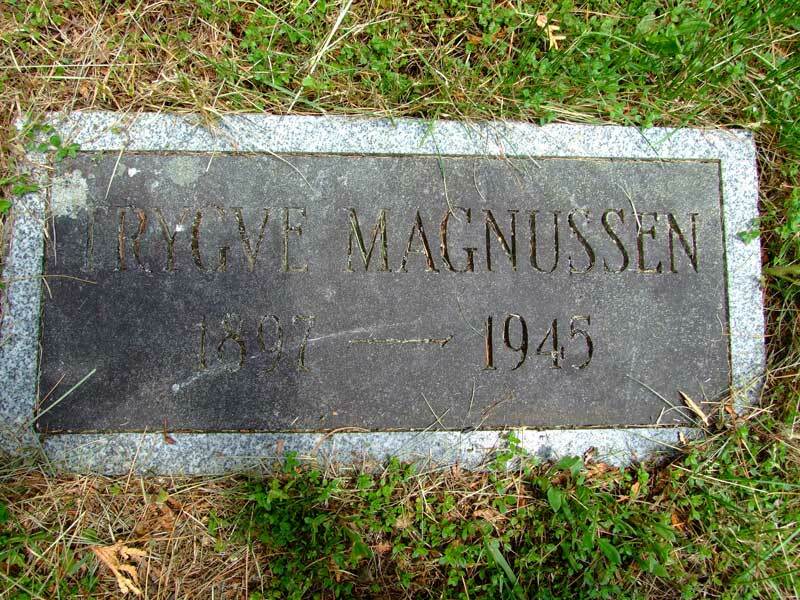 Trygve Magnussen, born in Bodø on Sept. 19-1897, served as cook on Brimanger until he became ill and had to pay off on June 13-1944. 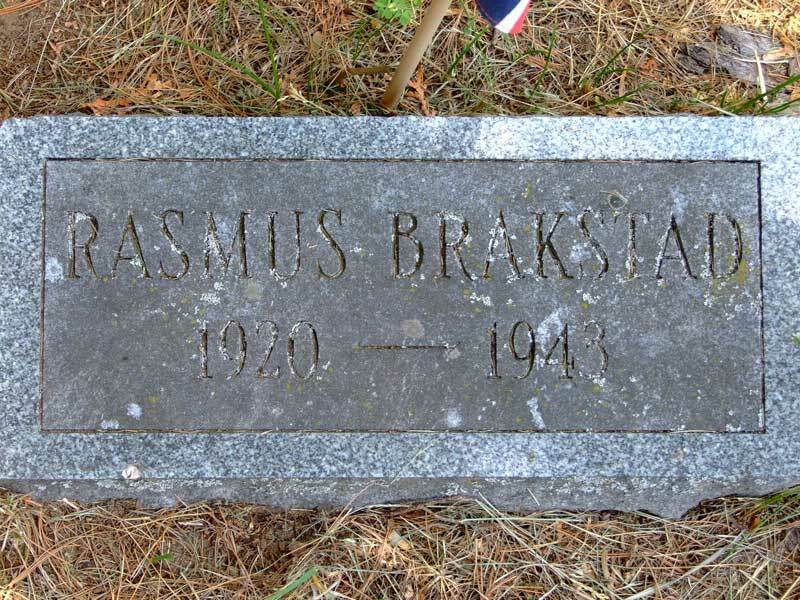 Died on July 25-1945 at Gabriels Sanatorium, New York. This means that he must have known Haakon Andreas Engh above. 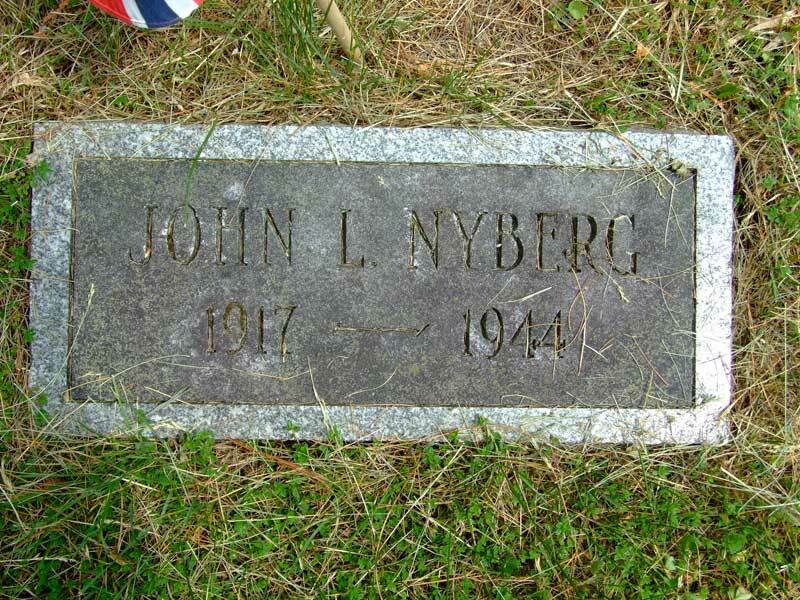 John L. Nyberg was born in 1917, died in 1944 (the "Krigsseileren" article says he died in 1945, and gives his last name as Nyborg) - no further details are available. 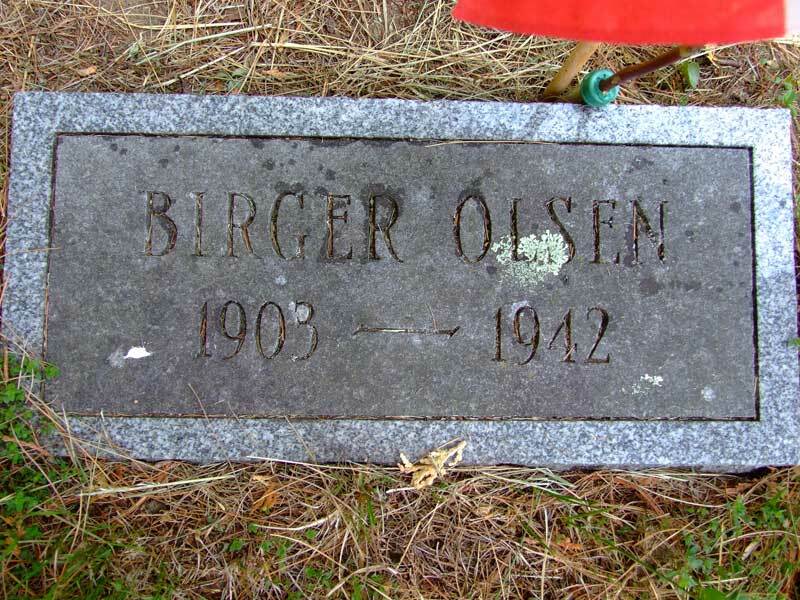 Birger Kornelius Olsen, motorman, was born in Kristiansund on Oct. 10-1903. 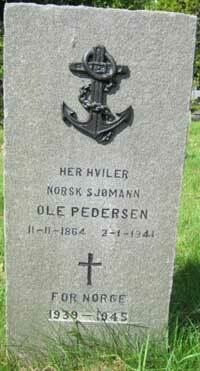 He was in allied service during the war, his last ship being Topdalsfjord. "Våre falne" states that after having been torpedoed he drifted around in a lifeboat for 8 days in the winter of 1941. Later became ill and died in New York on Nov. 18-1942. Again, I can't get this to fit with the facts; I have no information that Topdalsfjord was ever torpedoed, so if this took place at all, it must have happened after the loss of another ship. 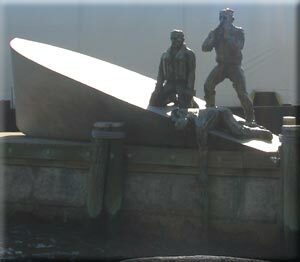 Birger Olsen is commemorated at the Memorial for Seamen in Stavern, Norway (external link) which gives the same information, but "Våre falne" is probably used as source. 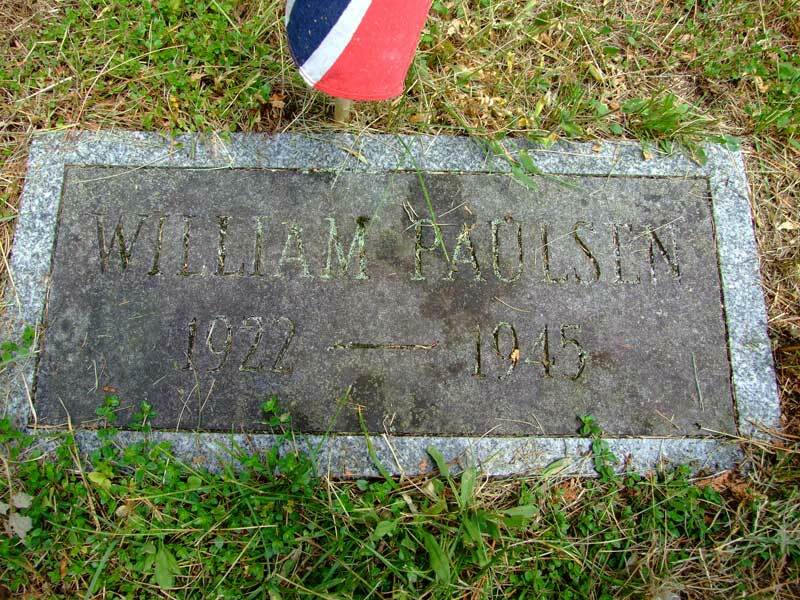 William Paulsen, motorman, born in Larvik on Apr. 28-1922, served on various ships in allied service until he became ill in the fall of 1943. Died in New York on Jan. 5-1945. 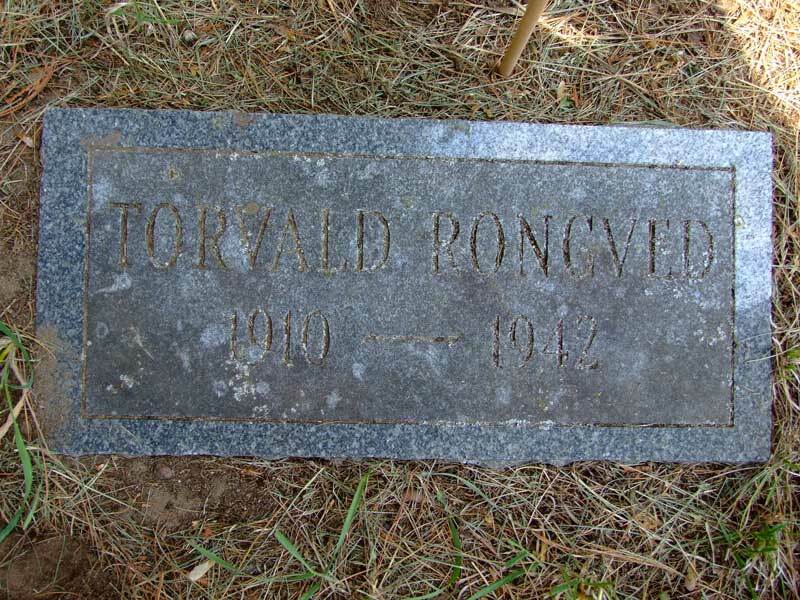 Torvald Rongved was born in 1910, died in 1942 - no further info available ("Krigsseileren spells his name as Rognved). 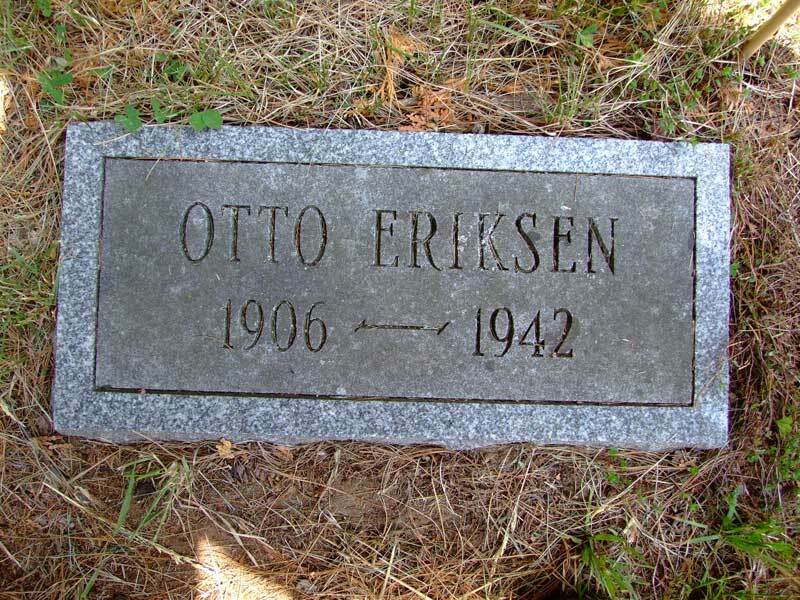 John Otto Svendsen, born in Idd on Nov. 28-1916, is said to have served as ordinary seaman on Margrethe Bakke until he contracted tuberculosis in the winter of 1942 and was sent to a sanatorium. Died at Saranac Lake on Febr. 4-1943. (For info, there's also a John O. Svendsen listed in the crew list for Bill, which was sunk in July-1942, but I have no way of knowing if this was the same person). Hildur Elisabeth Aass was born in Skien on Oct. 11-1913. 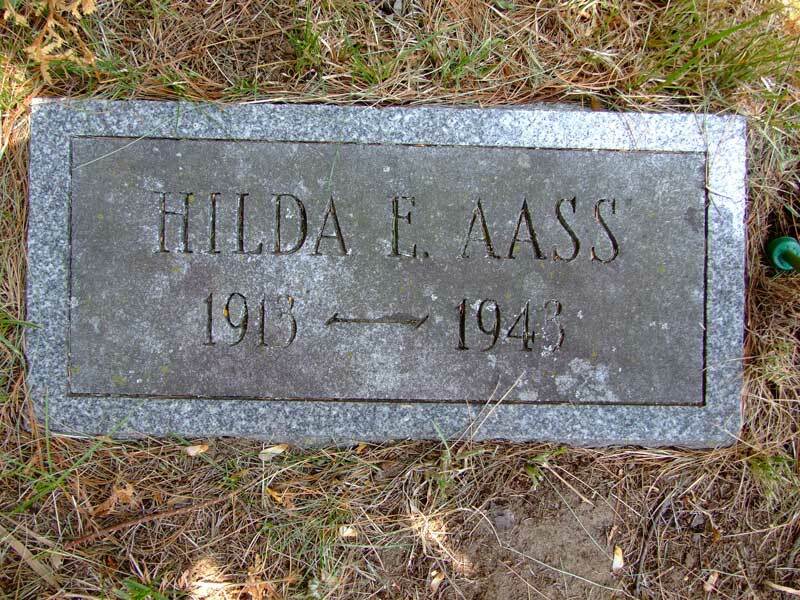 She was the daughter of Ada's captain, Hans Fredrik Melanchton Aass, born in Skien on Oct. 12-1888 and married to Hulda Aass from Skien. Hildur joined her father on Ada, leaving Norway before the German invasion (Apr. 9-1940), and because of the war she was prevented from returning to Norway as planned. She became ill and finally died of tuberculosis in Nov.-1943. This Guestbook message from her nephew (who supplied the above photo) says: "Her family at home (including her little sister Liv, who became my mother in 1957) did not receive the bad news until much later because of the war. My mother Liv has told me that my grandfather was so sad following the tragic death of his oldest child that he did not come out of his hotel room in NY for three months. 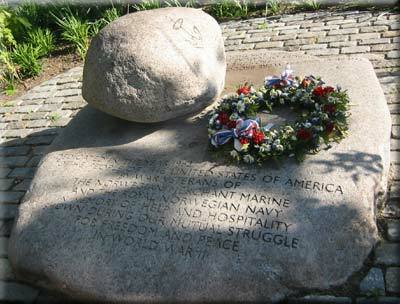 Still, he continued his work for the Merchant Marine and even participated in the invasion in Normandie. After the war he came home and died in 1954 at the age of 66. His daughter Liv is still in real good health at the age of 81". He adds: "I visited Saranac Lake with my family (wife and two daughters) in the summer of 2000. A beautiful place. We were impressed by how well kept this memorial place is. It was a very good experience to visit the grave of my aunt who died at the age of 30 and very far from home". 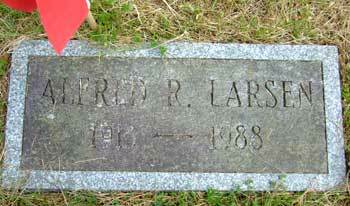 As mentioned further up on this page, the graves were initially tended by 2 Norwegian seamen who settled in Saranac Lake after the war, Alfred Larsen and Jacob Jacobsen. We did not see a stone for Jacob Jacobsen, so he may have been buried somewhere else. 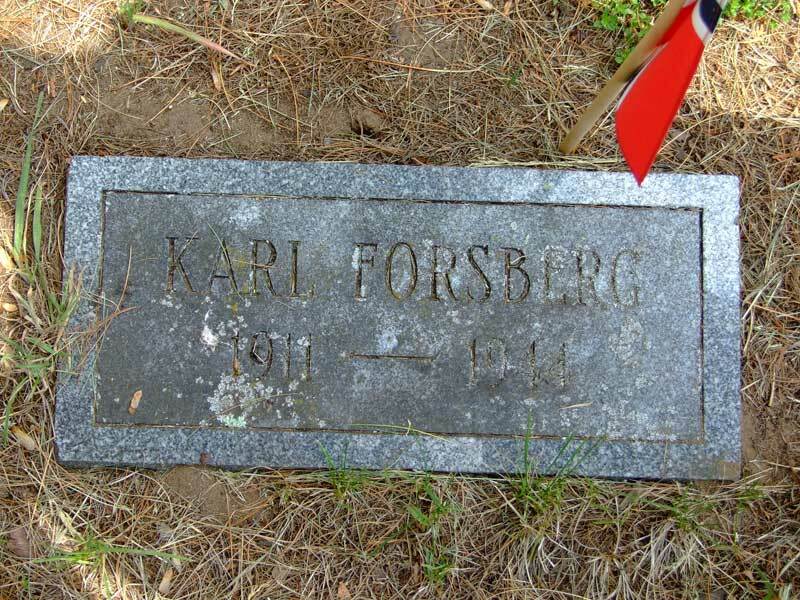 "Våre falne" also lists a stoker named Arnulf Forsberg who served on D/T Marit (since 1939) when he became ill, and died in New York on March 28-1941. Buried at Evergreen Cemetery in New York. See also this related message in my Guestbook. In Febr.-1941, 9 young men escaped from Haugesund in an attempt to get to Shetland. They almost made it. They had departed Haugesund in the 28 ft Kantonella, never to be seen again. Possibly lost during a hurricane off Shetland. 2 bodies drifted ashore at Yell, and the wreck of a small motorboat was also found. A week later 4 more bodies drifted ashore. They were all buried at Mid Yell Churchyard. Reist 17. mai 1980 til minne om ni unge menn som 20. febr. 1941 flyktet fra Haugesund - Norge med motorskøyta Kantonella. Alle omkom da båten (then comes an illegible word) ble knust mot land på Mid Yell - then another illegible word - then to 27. febr. 1941. 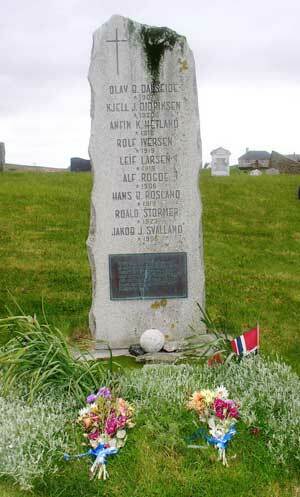 Erected May 17, 1980 in memory of nine young men who escaped from Haugesund, Norway with the motor vessel Kantonella. They all died when the vessel was crushed on shore at Mid Yell. May 17 is Norway's Constitution Day. David also sent me some pictures of the "Shetland Bus" memorial at Scalloway - they have been added to the Shetland Bus section and can be viewed on this page. All these pictures were received from Jackie and Peter Allen, Cardiff (see also this Guestbook message). If a descendant sees these and would like a bigger picture, please let me know and I'll pass it on. As can be seen, all of the above died on the same date; Cardiff sufferend a heavy air attack that day. 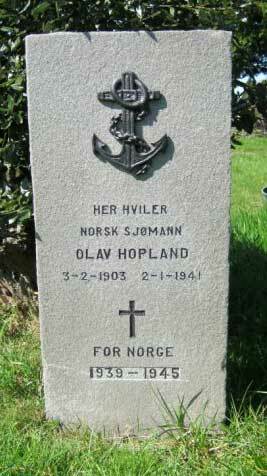 Olav Hopland had served on Senta (commemorated at the Memorial for Seamen in Stavern, Norway, external link). 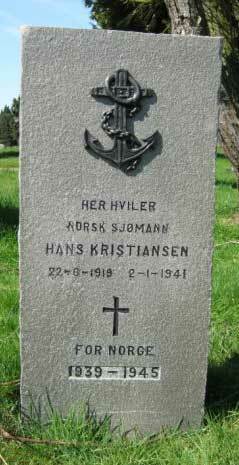 Hans Kristiansen had served as cook on the Swedish Ragnhildsholm (also commemorated at the Stavern Memorial, which says he had paid off and lived at hotel at the time). 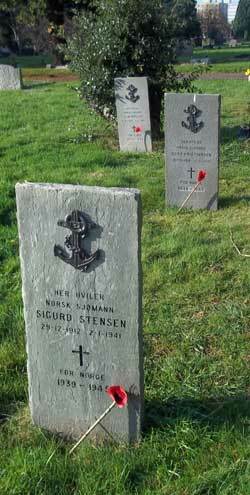 Sigurd Stensen served as stoker on Lisbeth (see this this page at the memorial). Lisbeth's Erling Vik is also said to have lost his life that day, but although the Allens have searched for his gravestone, they cannot find it - perhaps he was later taken home to Norway and buried there? Ole Toresius Pedersen worked as janitor at the seamen’s home in Cardiff and died while assisting with putting out a fire during the raid. Svein Andreas Theodor Aanonsen served on the whale factory Strombus for several years until she struck a mine in Oct.-1940, then joined Svint. Died on the date given when the ship was bombed and sunk - follow the link to Svint for more details. 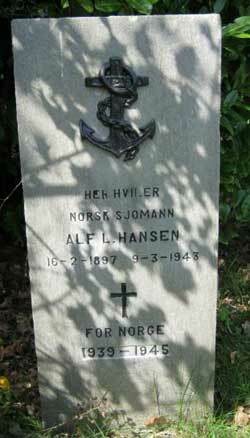 Mate Alf Ludvig Hansen served as 1st mate on Borgholm. Drowned in Cardiff, Jan.(?) 9-1943. 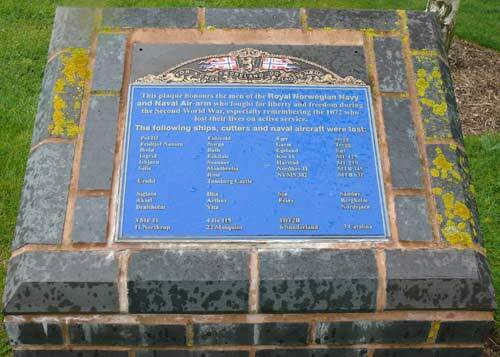 Stoker Henry Wang Karlsen (note different spelling) drowned in Cardiff on the date given  ship not known. Source for the info given on these seamen: "Våre falne". Below are all of these gravestones after they have been decorated with a poppy by Jackie and Peter Allen for Remembrance Day in Nov.-2010 (they said they'd try to do this every year). Sigurd Stensen in front, Hans Kristiansen in the middle and Olav Hoppland in the back. Ole Pedersen in front, Svein Aanonsen and Henry Vagn Karlsen in the middle and Alf L. Hansen in the back. 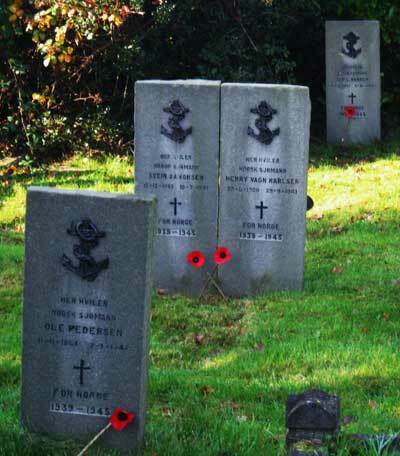 Below is another view of these 4 gravestones. Checking with "Våre falne", I find that Donkeyman Einar Johannessen was attacked and killed when on leave in Glasgow on Apr. 22-1941. He served on Marit at the time. Emil K. Simonsen is not included in these books, but for information on P. G. Pettersen, please see Snar. 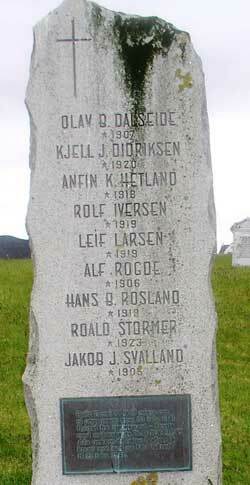 List of all Norwegians buried abroad - This is a PDF file (Norwegian Government website). Norwegian War Graves in Nova Scotia - 32 names are listed on the website of The Royal Norwegian Embassy, Ottawa website which says there are 35 graves of Norwegian sailors, soldiers and merchant seamen in Nova Scotia; 1 in Sydney, 4 in Lunenburg and the rest in Halifax. 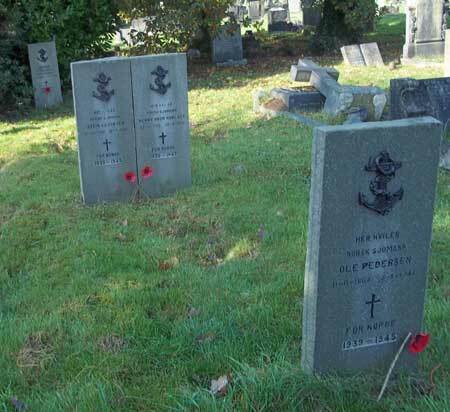 10 merchant seamen are buried at St. John’s Anglican Cemetery, Fairview. 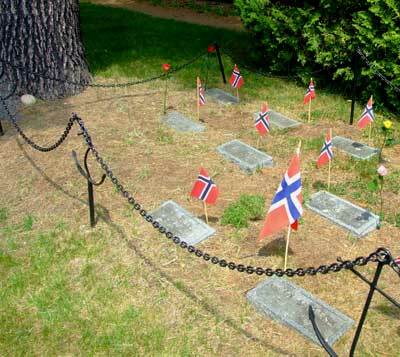 There are 17 Norwegian war graves in Camp Hill Cemetery, scattered over a wide area. 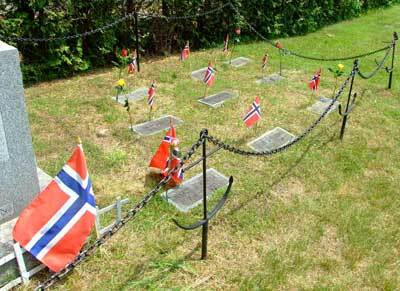 The site also gives some history of Camp Norway, and Norwegians in Nova Scotia during WW II. 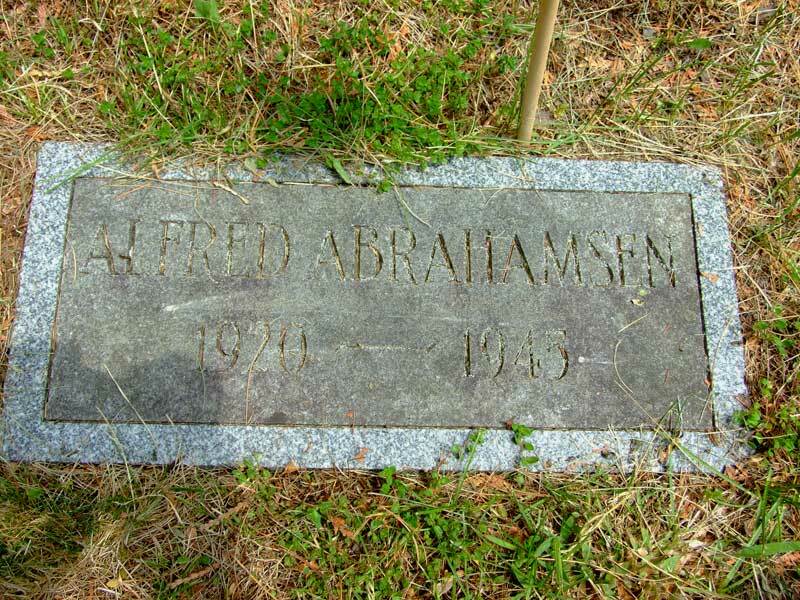 The first person listed, Alf Abrahamsen, served in the Norwegian forces in Canada; died at a hospital in Halifax on July 23-1942 - buried at Camp Hill, Halifax. 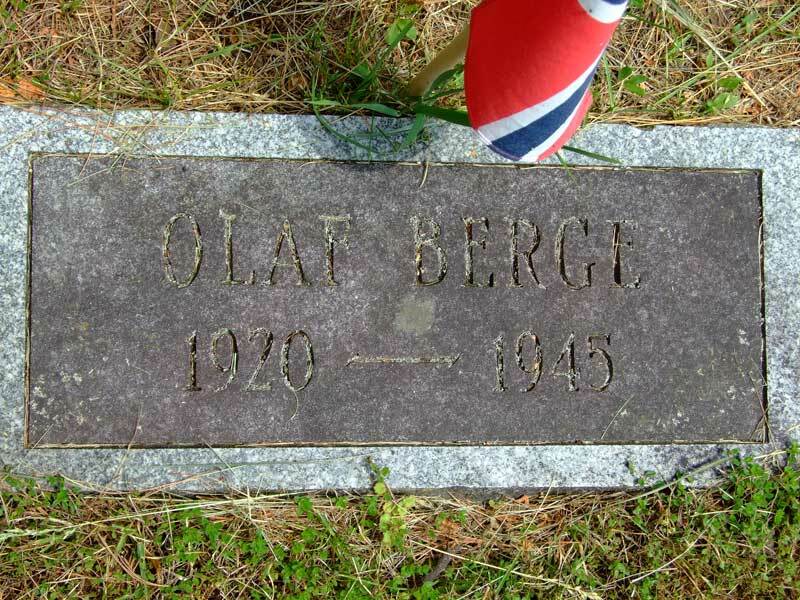 Falne fra Sem og Slagen under 2. verdenskrig - This is a Norwegian website, which lists the names of those who are commemorated on "Minnesmerke ved Valløy Kirke" - to find the names, scroll down on the page until picture of the memorial stone appears (text is in Norwegian). Deaths of Norwegians registered by the minister of the Norwegian Seamen's Church in Liverpool between 1919 and 1954. This is linked to page 1; click "neste" to see other pages - the site is searchable, and the name of the ship is given in some cases. The text here is also in Norwegian (National Archives of Norway website), but I'd be glad to translate the various terms. The site also has Deaths registered at the Seamen's church in Buenos Aires, as well as Deaths in Durban 1923-1948, Deaths in Shanghai 1934-1947, etc. etc. All these links go the the first page of each section, clicking on "neste" will take you to the next page. - Here's an overview of what's available.